Answers to business and industry questions are available around the entire globe with NEXTMap Global Analytics. 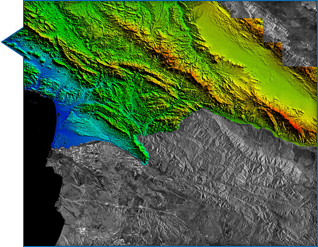 Our analytic service includes powerful terrain and imagery tools that can be accessed through the web. No need to pay for complicated data management, processing, acquisition, or analysis costs. Intermap’s analytics provide direct access to the information you need from a database of over 500 million km2 hosted in our secure cloud architecture. NEXTMap Analytics are designed from the ground up to provide the highest value service on a global scale for a fraction of the cost of acquiring, owning, or accessing raw data. Looking for a particular analytic or need something customized for your business? We can help. Intermap excels at providing data management through its massive data production infrastructure. Our team can create custom layers, collect new data, or format, edit, and process information needed for your business. Ask the experts and contact us for more information. Using elevation data from Intermap's NEXTMap USA – California datasets, the county of San Luis Obispo, California was able to safely and efficiently plan for an influx of new residents.